Waitrose fresh British chickens are reared by dedicated suppliers on selected farms. 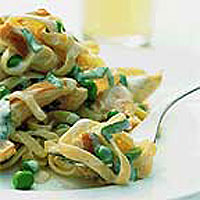 Here the chicken pieces are cooked in a fresh lemon and basil sauce and tossed into pasta with crème fraîche. This quick to prepare dish is ideal for a mid-week meal. Cook the pasta according to the instructions on the pack. Drain and return to the pan to keep warm. Meanwhile, slice the chicken breasts into 1cm thick slices. Heat the oil in a large pan and fry the chicken for 4-5 minutes until lightly browned and cooked through. The chicken is cooked when there is no pink meat and the juices run clear. Add the peas and cook for 1-2 minutes, then stir in the lemon juice, crème fraîche and seasoning. Heat gently to coat the chicken, then stir in the drained pasta and basil. Toss gently to mix. Serve immediately with extra freshly ground black pepper and plenty of salad leaves. Remember to wash hands, equipment and work surfaces thoroughly after handling raw chicken. Use 2 courgettes instead of the peas. Cut them into matchstick-sized pieces and add at step 2. If you don't have tagliatelle, use spaghetti or any other long ribbon pasta instead.